First time I am seeing different view of Eiffel Tower. Excellent idea and great shot. I really like statues and large figurines. The beauty of the statue plus the dramatic effect of The Eiffel tower and the moon at the head makes this a really nice shot. Nicely done. Truly fantastic! A shot like that takes vision and awareness of the artist. Kudos!!! You composition and prospective are superb. Love it. 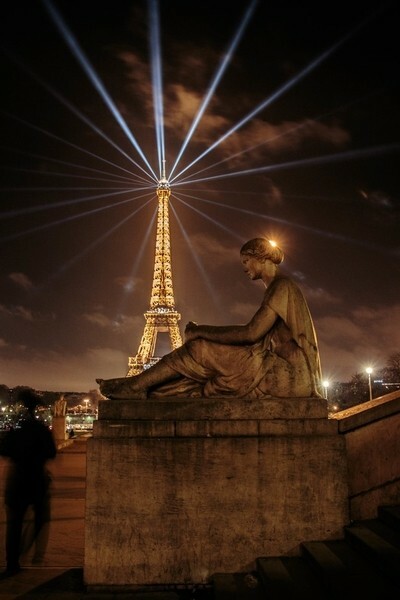 My fav of the City of Love contest...so well done and the statue in the foreground ties it nicely with the theme.. congrats!! This seriously should be on a postcard. As the picture would suggest this was taken in Paris. It was on the steps up to Palais de Chaillot which was on our way back to the metro. It was quite late, my girlfriend and I had spend most of the evening wandering the Christmas Markets along the Champs-Élysées and decided to go watch the light display at the Eifel Tower before heading back to the hotel. This was taken as we made our way back to the metro. I wanted to catch a full rotation of the Eiffel Tower lights but never intended on the street light providing the halo atop the statue. But once I crouched down to take the shot I liked the look of it so stuck with it. This was shot with a Canon 70D and the 18-135mm lens. I didn't have a tripod handy so resorted to a technique I stole from my days target shooting; using the camera strap as a sling to stabilise the shot. This allowed me to hold steady long enough to get a full rotation of the Eiffel Tower lights. This photo was very much a spur of the moment shot as I liked the contrast of stone statue and steel structure. The blurred figure to the left was an accident and because of it I actually originally rejected this photo when I got home. It wasn't until a few weeks later I came back to it and decided to take a second look. Since upgrading to a DSLR I've shot all my photos in RAW (except for the day I accidently switched off RAW and took only thumbnail sized jpegs, that was a painful discovery) which I process in Lightroom. For this one I only adjusted the lighting and contrast. When this was taken I would only have had a 70D with 18-135mm lens. I've since expanded and at night will have a 50mm lens and during the day a 10-18mm lens. When exploring try to avoid taking the 'perfect shot'. I rarely plan my photos on holiday and if something catches my eye I take the picture and sort through them later. I've found this leads to a lot more interesting photos when capturing monuments.